The United Socialist Party of Venezuela (Spanish : Partido Socialista Unido de Venezuela, PSUV) is a socialist political party in Venezuela which resulted from the fusion of some of the political and social forces that support the Bolivarian Revolution led by President Hugo Chávez. The Democratic Unity Roundtable is a catch-all electoral coalition of Venezuelan political parties formed in January 2008 to unify the opposition to President Hugo Chávez's United Socialist Party of Venezuela in the Venezuelan parliamentary election, 2010. A previous opposition umbrella group, the Coordinadora Democrática, had collapsed after the failure of the Venezuelan recall referendum, 2004. The process of merging most of the unidentified parties involved in the pro-Bolivarian Revolution coalition was initiated by Venezuelan president Hugo Chávez after he won the Venezuelan presidential election of 2006. The process was led by Chávez' own party, the Fifth Republic Movement, and was supported by a range of smaller parties such as the People's Electoral Movement (MEP), Venezuelan Popular Unity (UPV), the Tupamaro Movement, the Socialist League and others  which all together added up 45.99% of the votes received by Chávez during the 2006 election. Other pro-Bolivarian parties like the Communist Party of Venezuela (Partido Comunista de Venezuela, PCV),  Fatherland for All (Patria Para Todos, PPT)  and For Social Democracy (PODEMOS),  that cast 14.60% of the votes from that election, declined to join the new party. The Fifth Republic Movement was a Socialist political party in Venezuela. It was founded in July 1997, following a national congress of the Revolutionary Bolivarian Movement-200, to support the candidacy of Hugo Chávez, the former President of Venezuela, in the 1998 presidential election. The "Fifth Republic" refers to the fact that in 1997 the Republic of Venezuela was the fourth in Venezuelan history, and the Movement aimed to re-found the Republic through a constitutional assembly. Following Chávez' 1998 election victory, this took place in 1999, leading to the 1999 Constitution of Venezuela. Revolutionary Movement Tupamaro or Tupamaro is a far left Marxist political party and one of the most prominent colectivos in Venezuela. Several Tupamaros participate in peaceful movements while some believe the "idea of armed struggle as a means to gain power." The group supports the National Liberation Army (ELN) and allegedly had ties with FARC. Aló Presidente was a largely unscripted talk show that was hosted by Venezuelan President Hugo Chávez. It was broadcast on Venezuelan state television and radio stations every Sunday at 11:00 AM. The program did not have a fixed ending time, but usually ended by 5:00 PM, or as the program dynamics permitted. The show promoted the "Bolivarian Revolution" and blamed Venezuelan economic problems on its northern neighbor, the United States. Many Venezuelans tuned in because Chávez was known for unveiling new financial assistance packages every weekend. Beginning in 1999, Chávez spent an average of 40 hours a week on television promoting his "Bolivarian Revolution" policies. PODEMOS is a political party in Venezuela. In the 2005 legislative elections the party won 15 out of 165 seats in the National Assembly. Fatherland for All is a leftist political party in Venezuela. It was founded on September 27, 1997 by members of The Radical Cause party led by Pablo Medina, Aristóbulo Istúriz and Alí Rodríguez Araque. In 1998 the PPT supported the first presidential candidacy of Hugo Chávez. It is currently led by Rafael Uzcátegui. Party builds on cult of personality of the Hugo Chávez, with revolutionary symbols like Chávez eyes sometimes along with the party symbols. The Units of Battle Hugo Chávez (UBCh) is a collection of organizations with multiple members of PSUV involved that has both military and political characteristics. The UBCh originated as a group to defend the Bolivarian Revolution and support the party through electoral processes in Venezuela, and were transformed into their current name in 2013. They form the basic party unit in Venezuelan communities, and 4 or more of them form a People's Struggle Circle ( Círculo de Lucha Popular) in the community level. The Unit itself is divided into 10 Unit Patrols serving various functions for party members in various sectors. Major party in the "Great Patriotic Pole". The politics of Venezuela occurs in a framework explained in Government of Venezuela. Elections in Venezuela are held at a national level for the President of Venezuela as head of state and head of government, and for a unicameral legislature. The President of Venezuela is elected for a six-year term by direct election plurality voting, and is eligible for re-election. The National Assembly (Asamblea Nacional) has 165 members (diputados), elected for five-year terms using a mixed member majoritarian system. Elections also take place at state level and local level. Adán Chávez Frías is Venezuelan politician who was Governor of Barinas state from 2008 to 2017. Previously he was Ambassador to Cuba and then Minister of Education from 2007 to 2008. He is the elder brother of Hugo Chávez, who was President of Venezuela from 1999 to 2013, and of the Mayor of Sabaneta, Barinas, Anibal José Chávez Frías. Francisco Javier Arias Cárdenas is a Venezuelan politician and career military officer, and was the governor of Zulia state. He participated in Hugo Chávez's unsuccessful February 1992 coup attempt, being pardoned in 1994 by Rafael Caldera, along with the other conspirators. He was elected Governor of Zulia state in 1995 for the Radical Cause, and challenged Hugo Chávez for the presidency in 2000. He subsequently served as Venezuelan Ambassador to the UN, and deputy to the National Assembly after the 2010 parliamentary elections. The Bolivarian Forces of Liberation is a communist guerrilla organization operating in Venezuela. The group claims to fight for Bolivarianism, a left-wing, South American ideology. The group was formerly known as the Bolivarian Forces of Liberation – Liberation Army, but they have not attached the suffix to their name in recent years. Chavismo, also known as Chavism and Chavezism, is a left-wing political ideology based on the ideas, programs and government style associated with the former Venezuelan President Hugo Chávez that combines elements of socialism, left-wing populism, patriotism, internationalism, Bolivarianism, feminism, green politics and Caribbean and Latin American integration. Jorge Jesús Rodríguez Gómez is a Venezuelan politician and psychiatrist who was Vice President of Venezuela from January 2007 to January 2008, and served as Mayor of the Libertador Bolivarian Municipality from 2008-2017. He is the brother of Delcy Rodríguez, the current Vice President. Cilia Adela Gavidia Flores de Maduro is a Venezuelan lawyer and politician. She is married to the President of Venezuela Nicolás Maduro, making her the First Lady of the country. Since 2015, she is also a deputy in the National Assembly of Venezuela for her home state of Cojedes. In 2017 Constituent National Assembly was founded where she is member of the Presidential Commission. Her nephews, Efraín Antonio Campo Flores and Francisco Flores de Freitas, were arrested on November 2015 by the United States Drug Enforcement Administration in Port-au-Prince, Haiti, after attempting to transport 800 kilograms of cocaine into the United States. Henri Falcón Fuentes is a Venezuelan politician. He was mayor for two consecutive terms of Barquisimeto, Iribarren Municipality (2000–2008) and governor of Lara State (2008–2017). He was a candidate in the Venezuelan presidential election, 2018. 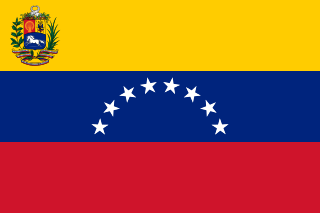 The Venezuelan presidential election of 2012 was held on 7 October 2012 to choose a president for the six-year term beginning February 2013. Bolivarian propaganda is a form of nationalist propaganda, especially in Venezuela, that utilizes the ideals espoused by Simón Bolívar, who helped lead Venezuela and other Latin American countries to independence from Spain, to exploit populist sentiments in support of local leaders. This type of propaganda has been particularly associated with Hugo Chávez's Bolivarian Revolution, which used emotional arguments to gain attention, exploit the fears of the population, create external enemies for scapegoat purposes, and produce nationalism within the population, causing feelings of betrayal for support of the opposition. The World Politics Review stated that as Chávez began "transforming Venezuela into a socialist state" that propaganda was "an important role in maintaining and mobilizing government supporters". The image of Chávez is seen on sides of buildings, on T-shirts, on ambulances, on official Petróleos de Venezuela (PDVSA) billboards, and as action figures throughout Venezuela. A 2011 article by The New York Times says Venezuela has an "expanding state propaganda complex" while The Boston Globe described Chávez as "a media savvy, forward-thinking propagandist" and that he had "the oil wealth to influence public opinion". The Simón Bolívar Great Patriotic Pole is a left-wing socialist electoral alliance of Venezuelan political parties created in 2012 to support the re-election of Hugo Chávez in the 2012 presidential election. The National Commission of Propaganda, Agitation and Communication is a Venezuelan propaganda organization belonging to PSUV, the ruling party of the Government of Venezuela. The Units of Battle Hugo Chávez (UBCh) is a collection of organizations with multiple members of PSUV involved that has both military and political characteristics. The United Socialist Party of Venezuela Youth is the youth wing of the United Socialist Party of Venezuela, which constitutes the initial scope of action of young people within the militant activity and under the party's guidelines. North Korea–Venezuela relations are relations between the Democratic People's Republic of Korea and the Bolivarian Republic of Venezuela. Venezuela is one of the five countries in Latin America that has an embassy of North Korea along with Peru, Cuba, Brazil and Mexico. ↑ Lopéz, Ociel Alí (11 July 2018). "Chavismo: Its Strength Could Be its Greatest". acla.org. Retrieved 27 January 2019. ↑ María, Eva. "Why "Twenty-First-Century Socialism" Failed". jacobinmag.com. Retrieved 27 January 2019. ↑ "Conference Proceedings Library". www.ipsa.org. Retrieved 22 February 2019. ↑ Kryt, Jeremy (7 December 2015). "Venezuela's Opposition Wins Big, But Maduro's Still There". The Daily Beast. The Daily Beast Company, LLC. Retrieved 10 January 2017. ↑ Hausmann, Ricardo; Rodríguez, Francisco R., eds. (2014). Venezuela Before Chávez: Anatomy of an Economic Collapse. Penn State Press. ISBN 9780271064642. ↑ Ciccariello-Maher, George (28 March 2007). "Against Party Bureaucracy: Venezuela's PSUV and Socialism from Below". MROnline. Monthly Review Foundation. ↑ "Himno del PSUV". psuv.org.ve (in Spanish). Retrieved 27 January 2019. ↑ "Venezuela Opposition Won Majority of National Assembly Seats". Bloomberg. 7 December 2015. Retrieved 7 December 2015. ↑ Greg Morsbach (19 December 2006). "Venezuela head seeks party merger". BBC . Retrieved 16 October 2013. ↑ "Home – Grupo Milenio". Milenio. Retrieved 27 April 2016. ↑ "Presidential Election December 3, 2006" (in Spanish). National Electoral Council of Venezuela . Retrieved 16 October 2013. ↑ "Podemos no se disuelve y propuso una constituyente: "No participaremos jamás de pensamientos únicos"" (in Spanish). 5 March 2007. Archived from the original on 5 March 2007. Retrieved 10 April 2017. ↑ Chris Carlson (7 March 2007). "Chavez Presents Plan for Socialist Unity Party of Venezuela". www.venezuelanalysis.com. Retrieved 16 October 2013. ↑ Gregory Wilpert (5 March 2007). "Chavez Allies Delay Decision on Merging with New Venezuelan Socialist Party". www.Venezuelanalysis.com. Retrieved 16 October 2013. ↑ (in Spanish) El Universal , 19 March 2007, "Los que se quieran ir, váyanse, pero escojan bien cómo irse"
↑ Agencia Bolivariana de Noticias (ABN). "MEP aceptó propuesta de Partido Socialista Unido de Venezuela". Aporrea. Retrieved 27 April 2016. ↑ Agencia Bolivariana de Noticias (ABN). "UPV se disuelve para formar parte del Partido Socialista Único de Venezuela". Aporrea. Retrieved 27 April 2016. ↑ "El Tiempo – El Periódico del Pueblo Oriental" . Retrieved 22 February 2019. ↑ Agencia Bolivariana de Noticias (ABN). "Liga Socialista se adhiere al PSUV". Aporrea. Retrieved 27 April 2016. ↑ Prensa MDD. "MDD apoya el llamado a conformar el PSUV". Aporrea. Retrieved 27 April 2016. ↑ "PSUV: Partido Unión se disuelve para incorporarse al PSUV" . Retrieved 22 February 2019. ↑ "PSUV: Propuestas del Movimiento Cívico Militante (MCM) sobre el Partido Único y el Socialismo del Siglo XXI" . Retrieved 22 February 2019. ↑ "PSUV: Partido Independientes por la Comunidad se incorpora al PSUV" . Retrieved 22 February 2019. ↑ Kiraz Janicke; Federico Fuentes (14 January 2008). "Chavez Inaugurates Founding Congress of New Socialist Party of Venezuela". Venezuelanalysis.com . Retrieved 17 January 2009. 1 2 3 "Venezuela Is On Borrowed Time". Business Insider. 29 November 2014. Retrieved 1 December 2014. ↑ "Fourth PSUV congress gets underway". country.eiu.com. Retrieved 22 February 2019. 1 2 "Contraataque de Maduro: alista las "Unidades de Batalla Hugo Chávez"". Infobae. 18 February 2014. Retrieved 19 November 2014.